Your next hunting getaway is just a click away. Below you’ll find a list of limited-time specials and packages. Take advantage of these discounted rates today and we’ll see you on the water soon! 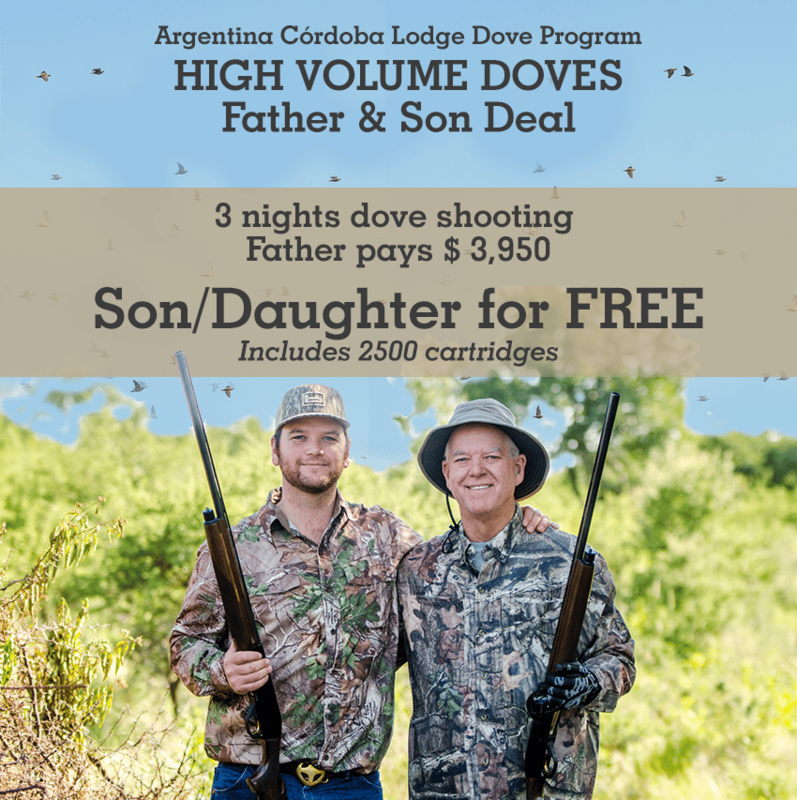 Includes: 3 nights at Córdoba Lodge based on double room, all meals and open bar, 6 hunting sessions, ground transfer to/from Airport, 2500 cartridges to be used by either/both hunters, gun rental (more than 100 guns in stock), guides and field assistant. Not Included: hunting licenses, tips, extra shells and single room upgrade. For fathers with multiple children, call us for competitive rate information. Some restrictions apply. list await you at the end of the day. After the shooting portion of your holiday, it’s a short drive to Estancia Dos Lunas. spectacular mountain vistas of the Cordoba region. Includes: Accommodations for 4 nights (2 at each Lodge); based on single-room occupancy; guided hunting each day; hunting licenses and gun rental; and all ground transfers to/from Córdoba City upon arrival and on departure. 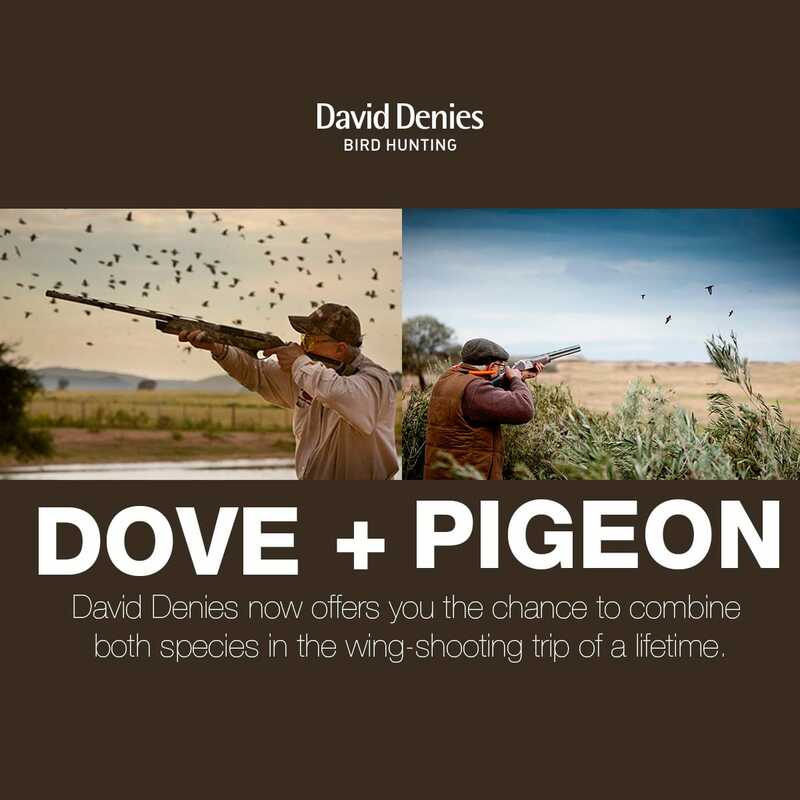 Season: Dove season is year-round, but this special coincides with prime pigeon season: June 15 to Sept. 15. Description: Argentina’s Córdoba Province is renowned for its massive flocks of eared doves. But Córdoba is also home to exceptional wild pigeon hunting. Normally hunted over decoys, these fast-flying birds are challenging and, ultimately, a lot of fun. David Denies gives you the opportunity to hunt both species during this hunting trip of a lifetime. Hunters will spend 2 full days at Montaraz Lodge, hunting pigeons over decoys, before a short transfer to La Dormida Lodge for 2 more full days of high-volume dove hunting. Rate: $ 3,080 p/person – Based on SGL room and shared boat. Location: Pica Zuro Lodge for doves, located in Córdoba, and Delta Lodge, which is just a short drive from Buenos Aires. 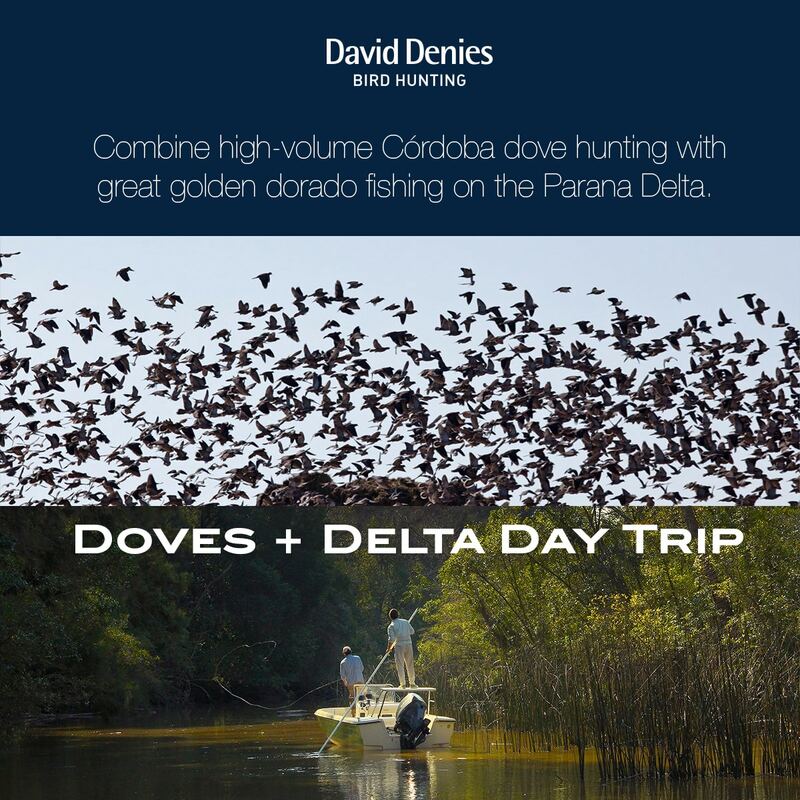 Description: Combine high-volume Córdoba dove hunting with great golden dorado fishing on the Paraná Delta. Our unique dorado fishery is just 45 minutes from Buenos Aires, where you’ll fish secluded wetlands, with skyscrapers in distant view. Fly fishing for dorado is our specialty. You’ll also have shots at tararira, another exotic, ambush-style species. Travel between the doves and dorado is easy—let us send you a complete itinerary outlining the two venues! Includes: Accommodations for 3 nights at Pica Zuro Lodge; based on single room occupancy; guided hunting; hunting licenses and gun rental; all ground transfers upon arrival and on departure dates; pick up at domestic airport and transfer to marina for fishing; 1 night full board at Delta Lodge coupled with 1 full day guided fishing—all fishing tackle included; and transfer back to the city or airport at the end of your stay. Excludes: Shotgun shells, gratuities, and round trip domestic airfares between Buenos Aires and Córdoba. Location: Pica Zuro Lodge for doves, located near Córdoba, and Red Stag hunting at Tupungato, out of Mendoza, or at Junín Lodge in northern Patagonia. Timing: This special is valid March 20 to April 7 for the Junín program, or March 20 to May 30 for Tupungato. 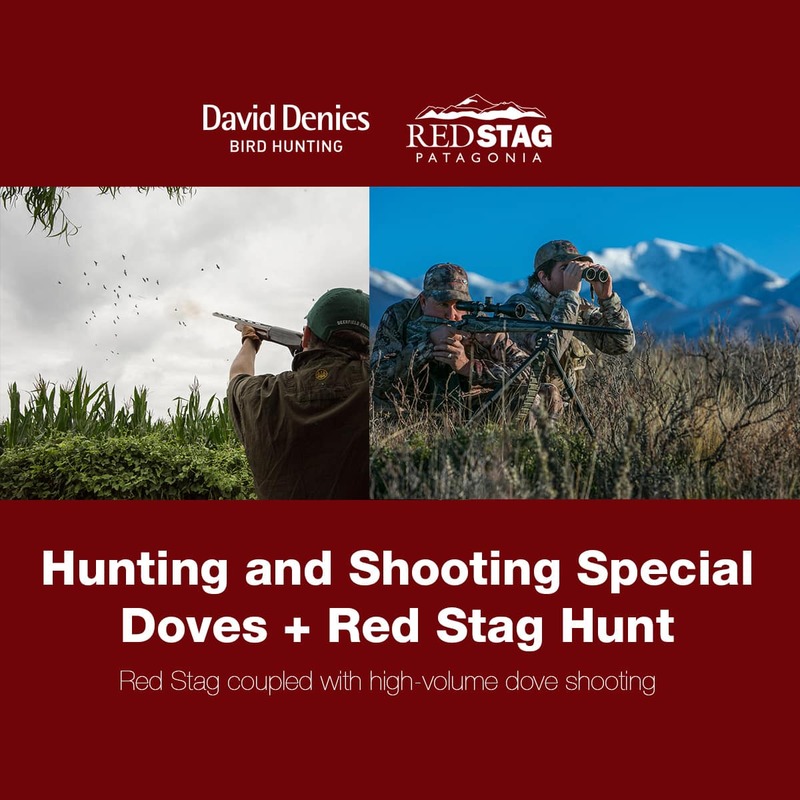 Description: 2 nights Dove hunting + 5 Night Red Stag Hunt at Junín or Tupungato. 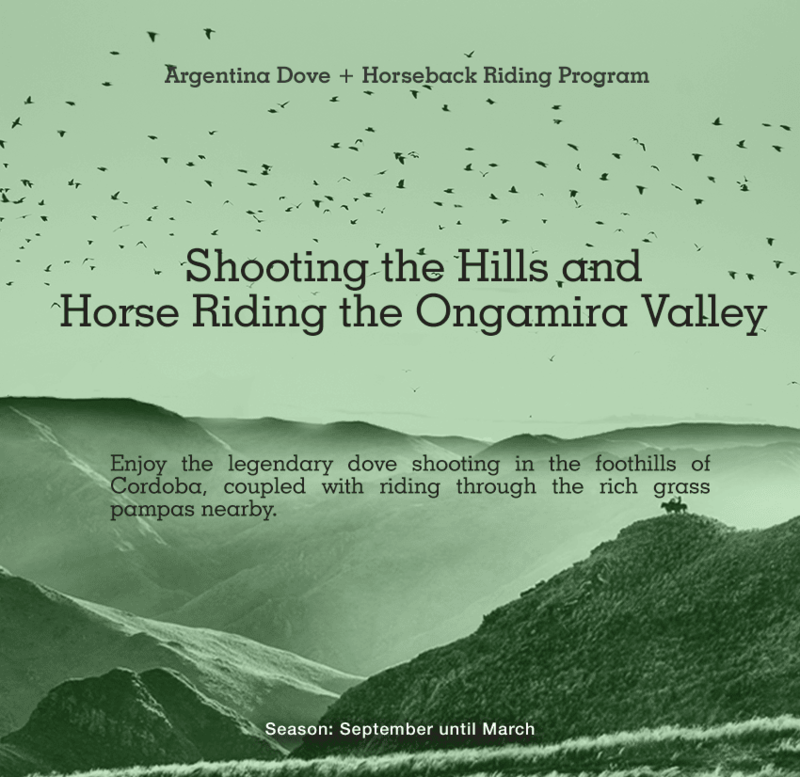 Dove hunting will take place at Pica Zuro Lodge, in the productive Córdoba region. Pica Zuro is the ultimate dove hunter’s home with spacious rooms, broad verandas for gathering or relaxing with friends, and impeccable service and delicious meals. Your dove hunting can easily be scheduled before or after the stag portion of your trip. The Junín area, in northern Patagonia, has one of Argentina’s largest herds of Red Deer. Our lodge is located on a 100,000-acre family owned estancia in the high desert foothills of the Andes. The surrounding landscape encompasses lush green valleys and intimate creeks, set against a backdrop of awe-inspiring peaks. Stags frequent these rich pastures to feed. The estancia is entirely fence free and hunters will encounter impressive herds of deer daily. Owned by pioneering Mendoza, Argentina natives, your hosts have been breeding and managing trophy stags for more than 20 years. By inter-breeding local stock with the best bloodlines from Europe and New Zealand, today they oversee some of the biggest, healthiest herds in the country. Atamisque Lodge is located close to the hunting ranch. The exclusive preserve spans 20,000 acres and is surrounded by a larger 120,000-acre ranch. The fertile valleys of the Mendoza Andean foothills provide great habitat for Red Deer that have developed impressive racks, with some specimens naturally reaching the 400 SCI+ class. Includes: Hunting licenses and gun rental at both locations; 2 night accommodations at Pica Zuro with full board; guided hunting each day; all drinks including wine, beer, and spirits; land transfers in/out Córdoba airport; five night accommodations and full board at your chosen stag lodge; 2/1 guided stag stalking for five days, plus trophy fee for one stag and all ground transfers. Excludes: Shotgun shells, gratuities, domestic flights and Sanitary and Export papers. Rate: $ 5.265.00 p/person – Based on Shared room/boat. 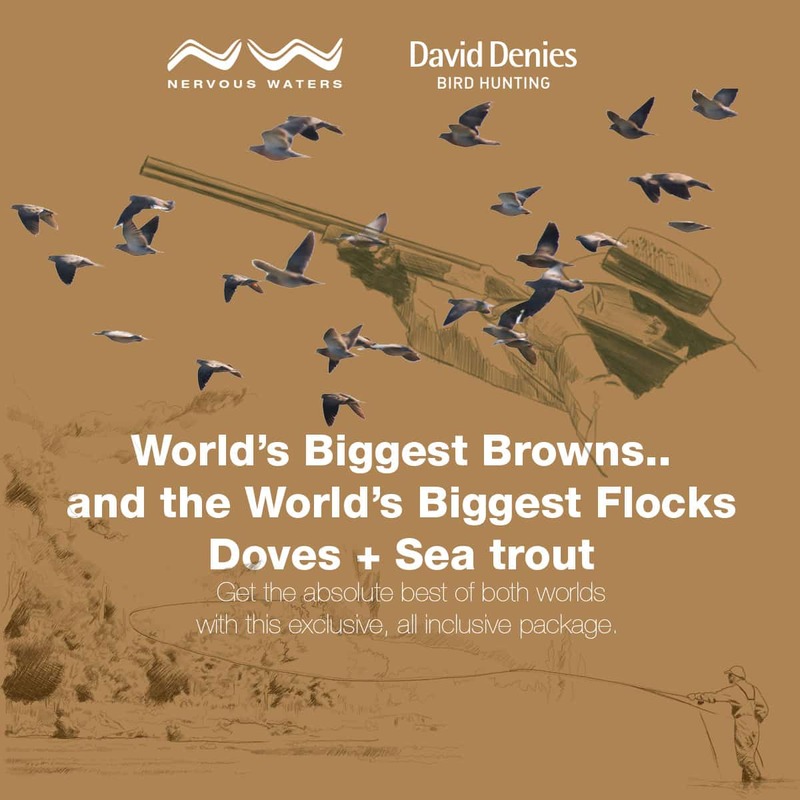 Description: A classic combo for the complete sportsman—featuring exciting fly-fishing and fast-paced dove hunting. 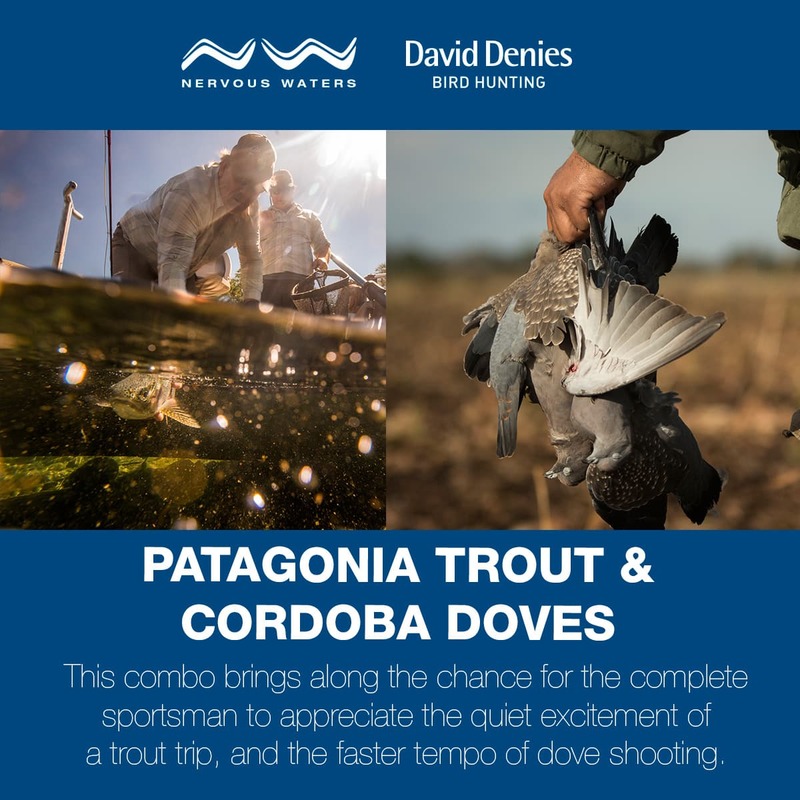 After five nights of stalking wild Patagonia trout, move to the fields and hills of Córdoba for high-volume dove hunting. NPL and Pica Zuro lodges consistently exceed expectations for fine accommodations, delicious meals, and of course awesome Argentine wines. Includes: Hunting licenses and gun rental; two night accommodations at Pica Zuro Lodge; pick up/drop off at Córdoba airport; 5 nights at NP Lodge, pick up/drop off at airport; fishing tackle, fishing licenses; and all domestic flights to/from lodges. Restrictions: 4 guests minimum. Does not include holidays (Christmas and New Years). Rate: $ 8,710 p/person – Based on SGL room and shared guide. Location: Pica Zuro or La Dormida lodges for doves near Córdoba; and sea-run brown trout at Villa María or Kau Tapen Lodges based out of Rio Grande, Tierra del Fuego, Argentina. Description: Two of the best things in Argentina (not including the steaks and the wine) are fishing for big sea-run brown trout and hunting doves in Córdoba. Experience both with this exclusive, all-inclusive package. Men’s Journal magazine recently called Kau Tapen the “Churchill Downs of sea trout fishing” and Córdoba is world-renowned for its endless dove flights. Offerings at both destinations are at the top of their respective sports. And don’t worry about guns and equipment—we have you covered! What about equipment? We have gear and guns at both lodges. Bring as little or as much as you like and we’ll make sure you’re fully kitted for the day’s pursuits. Trips can be scheduled in either order, with fishing first or last, depending on preferences and availability. Includes: One night at Buenos Aires Loi Suites Htl + 7 nights & 6.5 days fishing at Kau Tapen + 2 nights and 2 days at Pica Zuro or La Dormida; transfers from international airport terminal to your hotel, 1 night at Loi Suites Recoleta Hotel, hotel transfer to domestic airport; flight Buenos Aires-Rio Grande (round trip), flight BA- Córdoba (round trip); all meals and drinks, guided fishing and hunting, fishing and hunting licenses. Location: Pica Zuro or La Dormida lodges for doves near Córdoba; and duck hunting out of Jacana Lodge in Lincoln, Buenos Aires. Plus a night at Alvear Palace Hotel in Buenos Aires between both programs. Timing (Specific dates apply for this special): May 1 – July 31 Specific dates apply for this combination during these months. 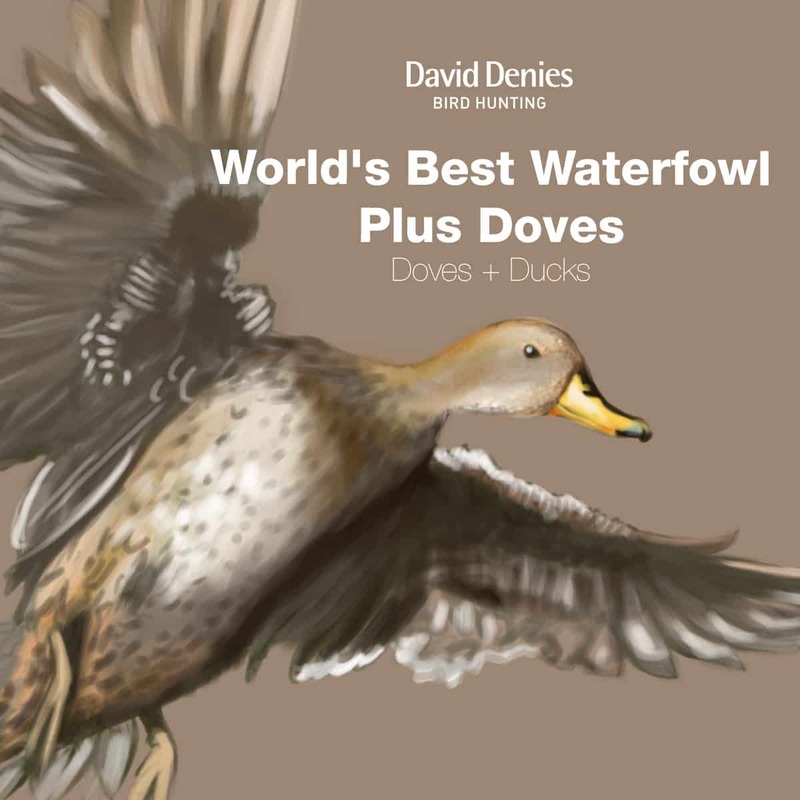 Description: When it comes to duck and doves, this is a dream trip. Simply, Jacana offers a duck club atmosphere, crisply executed outfitting, and liberal limits on over a dozen species of highly desirable waterfowl. Couple that with the high-volume dove hunting in Córdoba and the adventure just keeps getting better. Finally, enjoy a night in between at the elegant Alvear Palace Hotel in Buenos Aires, where you can catch your breath, while grabbing a great steak or a show. Perfect. Includes: Meet & Greet at EZE airport, with ground transfer to Jacana (4 hour’s drive). Three nights at Jacana Lodge hunting ducks, with FULL board accommodations, Hunting Licenses and Gun Rental included. Ground Transfer back to Buenos Aires and 1 night at Alvear Palace Hotel. Domestic flight to Córdoba (AEP – COR) and transfer from Córdoba airport to the lodge. Three nights at Pica Zuro or La Dormida Lodge, with FULL board accommodations, Hunting Licenses and Gun Rental included. Return transfer from the lodge to Córdoba airport. Return flight to Buenos Aires (COR – AEP). Pick up at AEP airport and ground transfer to EZE INTL airport, where we’ll help you check. Restrictions: 4 guests minimum, and specific dates for this COMBO. Please contact us for a list of openings. Location: Pica Zuro or La Dormida Lodge for doves near Córdoba, coupled with 2 nights in Buenos Aires at Loi Suites Recoleta Hotel or the Buenos Aires Grand. Timing: May 1 – July 31 – This special is valid year round. 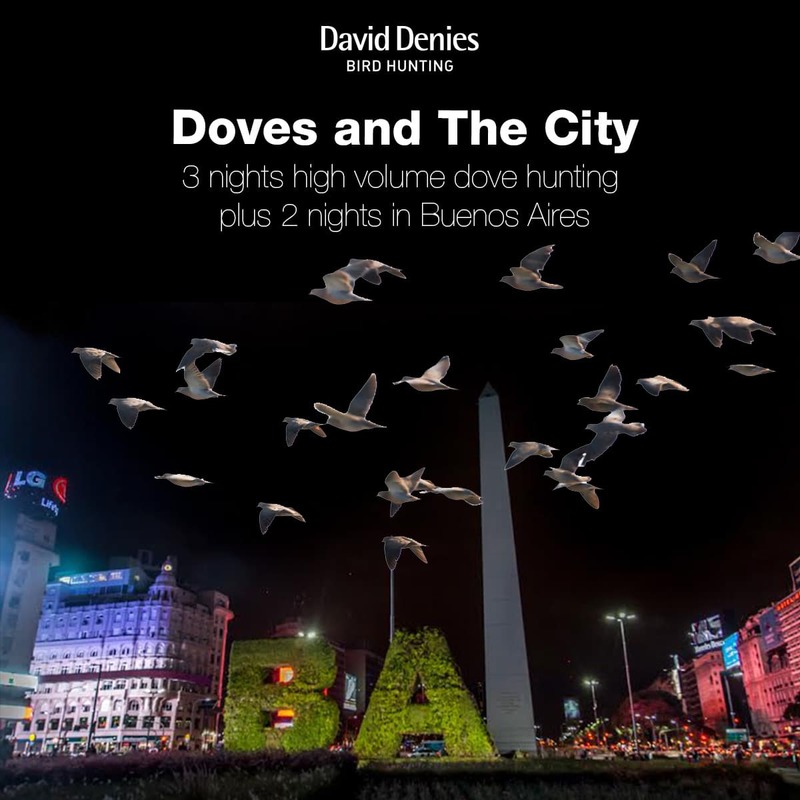 Description: Combine renowned dove shooting in a charming, bucolic setting with the bright lights of Argentina’s big city: Buenos Aires. You’ll find endless flights of doves—high, low, and everything in between—along with our legendary hospitality and field service. Then stay at the Loi Suites or Buenos Aires Grand and enjoy an evening of fine dining and entertainment on us. Includes: Three nights dove hunting at Pica Zuro or La Dormida, all meals and full board service, all guiding, all transfers to/from Córdoba airport; hunting licenses and gun rental as well as 1,750 rounds per hunter. 2 nights at Buenos Aires LoiSuites Recoleta hotel or Buenos Aires Grand, as well as pick up at AEP domestic airport with transfers and drop off at EZE INTL airport on your way back home. Also enjoy a tango show (dinner included) during your stay in Buenos Aires. Excludes: Shells + Tips + Domestic Flights to/from Córdoba. Restrictions: 4 guests minimum. Please contact us for a list of openings. Location: Pica Zuro or La Dormida Lodge, Córdoba, Argentina. Description: We often hear from couples saying that Mr. Dove Hunter is interested in traveling to Córdoba, but he isn’t so sure his spouse will enjoy it. Having a non-shooting companion can be expensive, and we understand that. That’s why we’ve designed an all-inclusive special for pairs with a non-shooter in the mix. This priced-right package includes 1,500 rounds of ammunition for the hunter, plus licenses, and gun rental. For the non-hunting partner, we’re also throwing in two free massages—so that she (or he) will have the opportunity to kick back, relax, and fully enjoy their stay. Read on for more details. 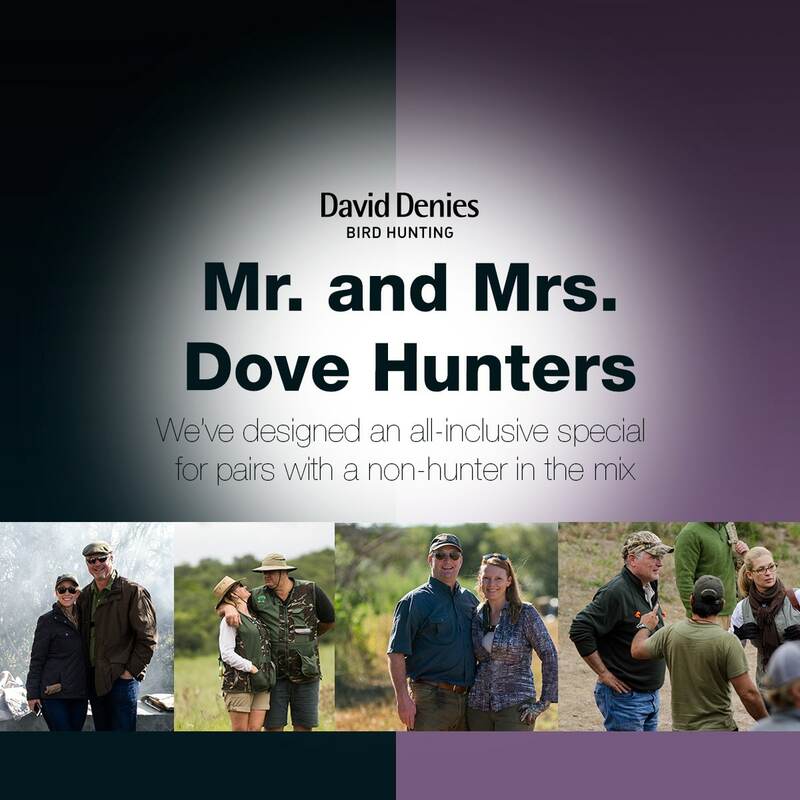 Includes: 3 nights dove hunting at LD or PZ—all meals, alcoholic beverages, and full board service; guiding, all transfers to/from Córdoba airport; hunting license, gun rental, 1,500 rounds for the hunter; and 2 free massages for the non-hunting spouse or partner.